Umami is savory taste beyond salty, sweet, bitter, and sour. It is a natural savory flavor from meats, cheese, or mushrooms that lures you to come back for more. The Umami burger did just that for me. After eating the burger for the first time, I was addicted and went back 3 days later for another. 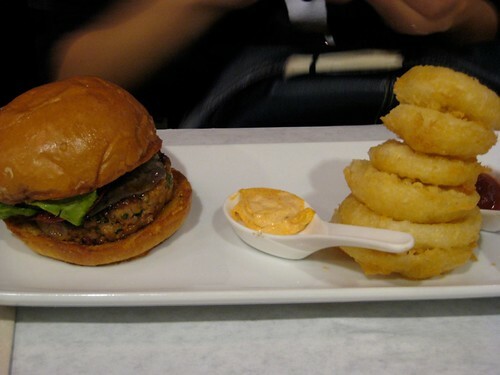 I went to Umami Burger for the first time last Wednesday. Umami Burger is in a quiet strip of La Brea. I've passed by it multiple times and never noticed it. We arrived at approx. 8 pm and waited 20 minutes to be seated. Umami Burger is not your typical hole-in-the-wall burger stand. 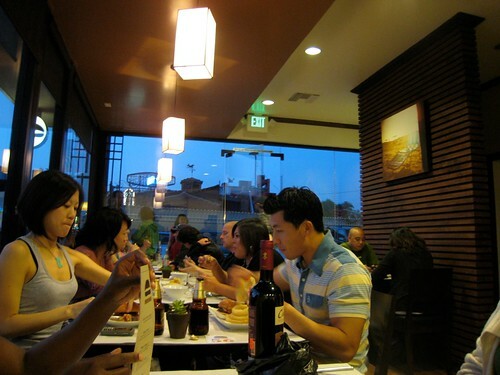 The space is modern and sleek, filled with black tables and chairs, ceiling high windows, and Asian inspired fixtures. It is a hybrid of a fast-food stand and sit-down restaurant. The tables are covered in white paper with the Umami logo. Waiters take your order, but then place the order number on your table, so other servers know where to deliver your burger. I ordered the Umami Burger. It came with caramelized onions, roasted and marinated tomato, Parmesan crisp, grilled shiitake mushroom, homemade ketchup and a medium rare meat patty on a sweat brioche bun. 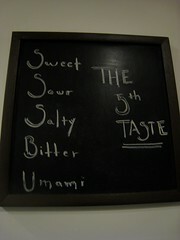 On my first bite, I was knocked out by the complexity of the flavors. Flavors of salty, bitter, sweet, sour and Umami in conjunction with the churchly, soft, chewy, texture and a well seasoned, perfectly cooked and packed meat patty created an amazing tasting burger. Loved it! Can I have seconds please? Triple Pork Burger - Fresh ground pork spiced with Chorizo and cob-smoked bacon, aged manchego, pimenton aioli. This burger was packed with so much goodness in the meat patty. The first bite was filled with a burst of flavors. It was much more flavorful, than any other burger I've tried. Hand Cut Fries - Tripled Cooked. Although, I prefer skinny crispy fries. It was good for steak fries. Ketchup - I did not enjoy the ketchup. It was more watery and too vinegary than I prefer. Please just give me the Heinz! Port and Stilton Burger (Blue Cheese, Port Caramelized Onions) with a glass of Charamba Douro 2005 purchased at the neighborhood liquor store down the street. It was recommended by Umami Burger. Loved the BYOB and the $5 corkage fee. I loved the burger, but do not recommend the wine with this Burger. The wine is too over powering for a burger that also has really strong flavors. I will be back! 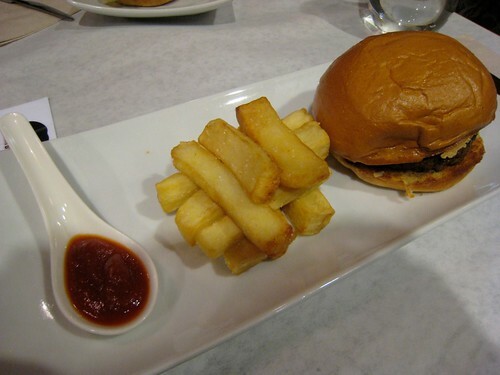 For my 3rd burger, I want to try the Truffle Burger. Truffle + Burger? Sold! I totally agree. The burger was small too. If i can finish one and still be hungry. there's a problem.